We are called by God to help others in need. God is not unjust; he will not forget your work and the love you have shown him as you have helped his people and continue to help them (Hebrews 6:10). Still, Jesus too knew that there were times that he must rest. Then, because so many people were coming and going that they did not even have a chance to eat, he said to them, “Come with me by yourselves to a quiet place and get some rest.” (Mark 6:31). 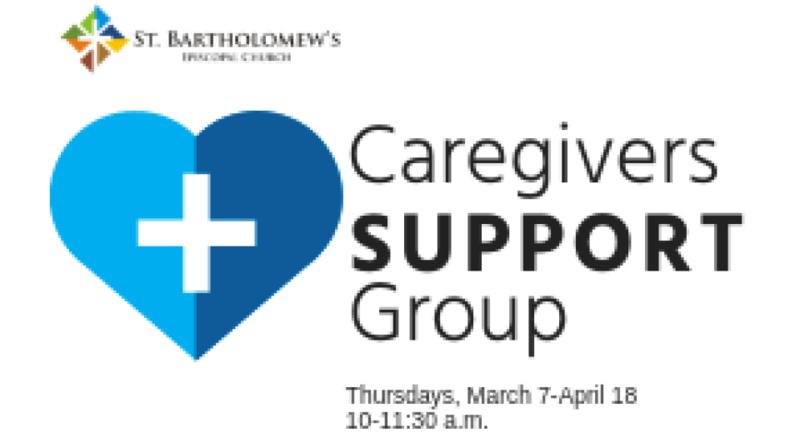 If you are a caregiver for an ailing or aging spouse, parent, sibling, child, or otherwise, this group is for you. We will create a safe space to share the joys and challenges of being a caregiver, and to explore ways to care for ourselves. Find strength and community along the way – you don’t have to walk this path alone. This group is free of charge, and are all welcome – you don’t have to be a St. Bart’s parishioner to participate! To join, please email Dawn Stary, , by October 4. Dawn Stary holds a bachelor’s degree in theology from the Loyola University Chicago and a master’s degree in pastoral care and counseling from the University of San Diego. She has been working as a pastoral counselor since 2006. She has served various populations both at churches and non-profits and has worked with individuals, couples, families and groups. Dawn has also taught classes on pastoral care, self-care and social teachings in the church and has spoken both nationally and internationally on her work as a pastoral counselor. She is a proud Buckeye from Cleveland, Ohio and has lived in San Diego since 2004 and she is a diehard Cleveland Indians and Chicago Cubs fan.